Eufy makes some fantastic products. Over the recent past I have had the opportunity to review their Genie smart assistant, their Smart Plug Mini, and even two of their RoboVacs – the 30C and the 11s. Well, in addition to making lots of wonderful smart accessories and products that make your home life easier, they also have a few products that revolve around helping you stay healthier! 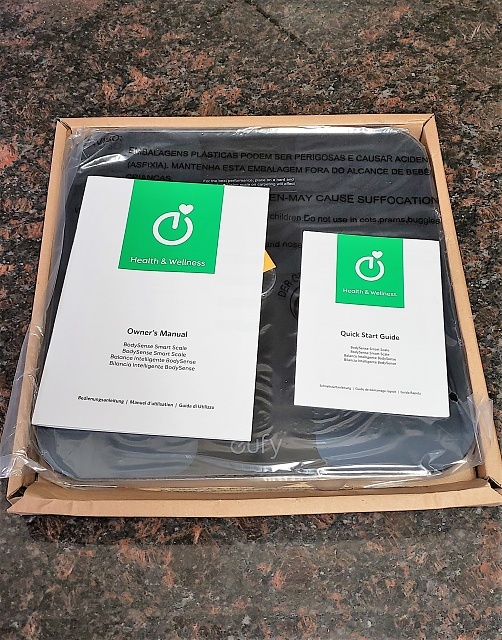 Today I’m here to talk about the eufy BodySense Smart Scale, a “smart” scale that works in conjunction with your phone or tablet utilizing the eufyLife app, and even integrates and syncs data with the Apple Health app! Want to learn more? 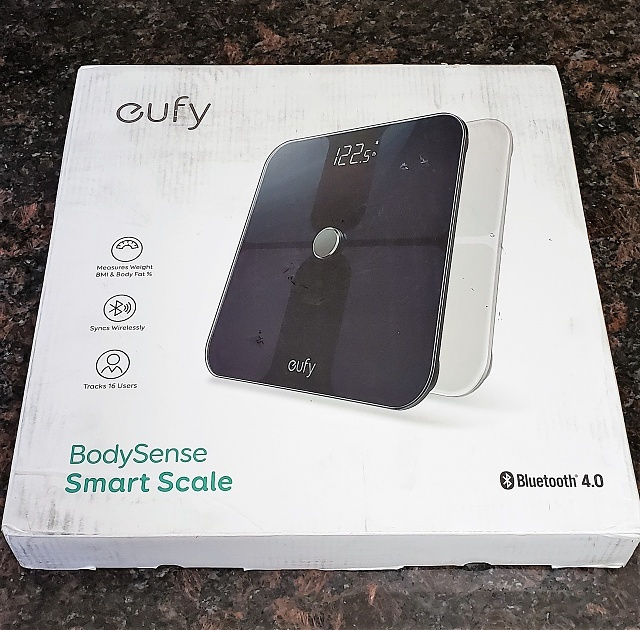 What is It: The eufy BodySense Smart Scale is the first “smart” scale that I have ever used. I’ve used plenty of dumb scales, and I mean dumb… those suckers are always telling me I weigh more than I actually do. OK, so maybe it’s not the scale’s fault, but they’re definitely bland and boring. Well, the Smart Scale is a definite upgrade over regular scales in many ways. First, it can track your user data (up to 20 different users), it can sync with health apps/programs on your phone or tablet, and it can even track your weight loss and other health trend information using the eufyLife app. 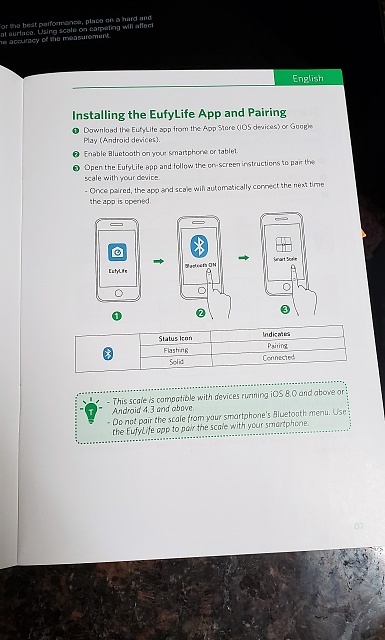 It’s easily downloaded onto your phone or tablet and syncs your data over the Bluetooth connection between your Smart Scale and device. How does it work: The Smart Scale is easy to setup, and even easier to use – and it comes with batteries! 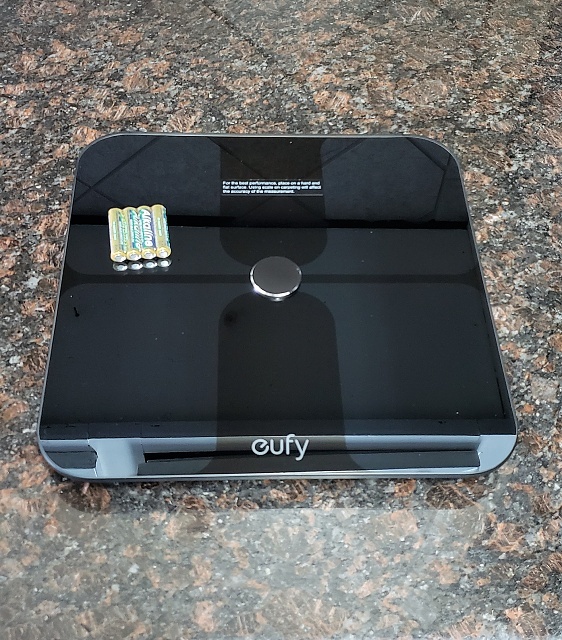 I was pleasantly surprised when I opened up the box to find that eufy included the AAA batteries needed to get the Smart Scale up and running. Once you have the batteries in, the scale will turn on and automatically enter pairing mode. The Smart Scale has a classy looking, large LED screen that displays your weight and also indicates data transfer to the app as it syncs – one other nice feature is that the Smart Scale auto-zeros itself, for increased accuracy. To connect the scale to your phone or tablet, you need to download the eufyLife app, which is found in the Apple Appstore, and Google Play store. For the app support to work, you will need to be running at least iOS 8.0, or Android 4.3. Once you get the Smart Scale connected, the rudimentary functions of the scale will work; all you need to do is step on it to find out how much you weigh. During the initial setup of the app, you will need to create an account to sign-in, which is self-explanatory. Once you’re signed in and connected to the scale, you will setup your health profile, which will include things like your weight, height, age, etc… This will help the scale calculate things like your Body Mass Index (BMI), which has been one of the most popular and reported metrics on health in the past few decades. -	Place the scale on a flat, hard surface. Soft surfaces such as carpeting will affect the performance of the scale. -	Step on the platform with bare feet. Stand still and keep contact with electrodes until measurement is complete. -	For the most consistent measurements, weigh yourself at the same location and time of day. eufyLife App: The eufyLife app is your gateway to all of the health things that the Smart Scale has to offer. If you don’t connect your scale to the app, you are missing out on all of the wonderful features that make the scale “smart”, such as BMI measurement, integration to the Apple Health app, tracking trends and fluctuations in your weight, and helping you chart your weight loss by setting goals and keeping track of them. The eufyLife app is easy to use and can be downloaded and setup quickly. Another nice feature that the eufyLife app and Smart Scale bring to the table is the ability to track the health/weight data of up to 20 different users, which means you can put down the pen and paper and let the app take care of all of the leg work. And if that’s not enough, the Smart Scale also integrates with the Google Fit app and Fitbit app, for all of your body tracking. 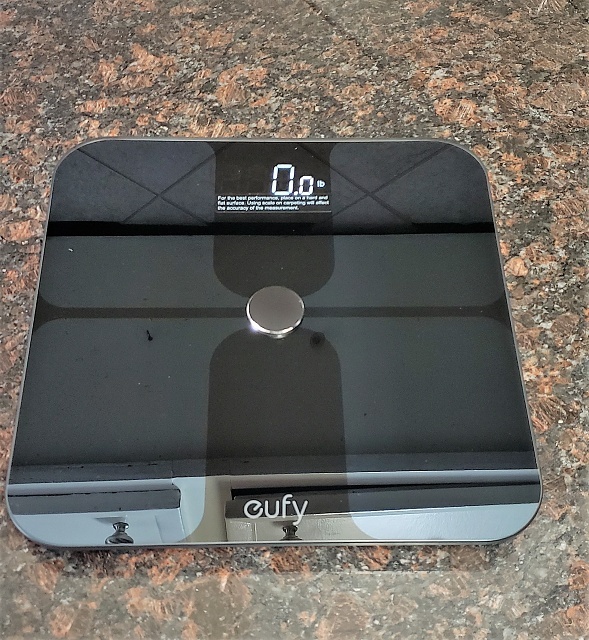 Conclusion: The eufy BodySense Smart Scale is a great addition to any home, and a must-have if you’re serious about keeping track of your weight and investing in your health. One of the most important parts of any diet and exercise plan is tracking your weight and BMI, and the Smart Scale does this with ease. Not only is it easy to use, it’s also easy on your wallet. The Smart Scale comes in at a meager $31.49 for the Black model, and $44.99 for the White model – the only difference is the color. If you’re interested in picking up one of eufy’s BodySense Smart Scales, you can find them on Amazon for the low price of $31.49 to $44.99, depending on color option. The scale also qualifies for Prime 2-day shipping - https://www.amazon.com/eufy-BodySens...cUvbUpU6451815 - As always, if you have any questions or comments, please feel free to leave them down in the comments section. [REVIEW] AUKEY PB-Y13 10000mAh Powerbank.